Fish and birds are able to regenerate their hearing after damage, but mammals are not able to do so, and hearing loss is irreversible in mammals like human beings. However, a new study has shown that the application of a particular drug can activate genes normally expressed during hair cell development. This work resulted from collaboration between researchers at Harvard Medical School, the Massachusetts Eye and Ear Infirmary, and Keio University School of Medicine in Japan. This finding is a first in the field or regenerative medicine. In the cochlea, small cells known as hair cells convert sound waves into electrical signals that are interpreted by the brain into sounds. 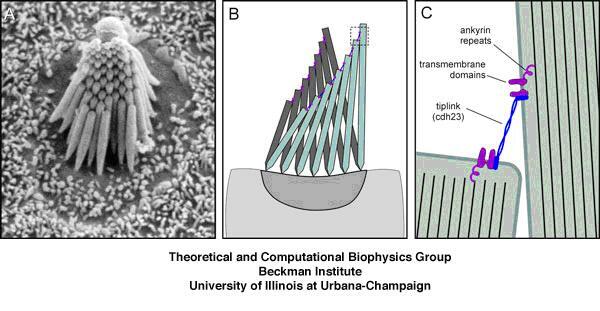 If these hair cells are damaged or destroyed by acoustic injury, then a permanent loss of hearing ensues. Such damage is treated with cochlear implants, which are surgically implanted devices that convert sounds to electrical signals. “Cochlear implants are very successful and have helped a lot of people, but there’s a general feeling among clinicians, scientists, and patients that a biological repair would be preferable,” said Albert Edge, an otologist at Harvard University and the Massachusetts Eye and Ear Infirmary and lead author of the Neuron paper that reports these findings. In previous work, Edge and his colleagues had shown that inhibiting the Notch signaling pathway was important for hair cells to form properly during fetal development (Jeon, S.J., Fujioka, M., Kim, S.C., and Edge, A.S.B. (2011). Notch signaling alters sensory or neuronal cell fate specification of inner ear stem cells. J. Neurosci. 31, 8351–8358). In their new study, Edge and his colleagues inhibited the Notch signaling pathway to determine, if such inhibition could initiate hair cell regeneration in adult mammals. They used a variety of approaches. In their first experiments, they used different inhibitors to determine their effects on isolated ear tissues. This allowed them to isolate one inhibitor in particular, the ɣ-secretase inhibitor LY411575, that led to increased expression of several molecular markers found in developing hair cells. Next, Edge and his co-workers tested the inhibitor in mice that had hearing damage and reduced hair cell populations as a result of exposure to a loud noise. They tagged cells in the inner ear to follow their fate and discovered that the inhibitor, when applied to the inner ears of the mice, caused supporting cells to differentiate into replacement hair cells. 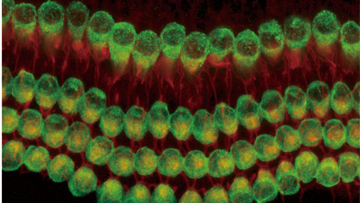 These newly formed hair cells partially restored hearing at low sound frequencies, but not at higher frequencies. This effect lasted for at least three months. This study examined the effect of the inhibitor when it was given one day after noise damage, which is a time when Notch signaling is naturally increased. This it is possible that a small window of time exists after an acoustic injury during which the drug is effective. See: Mizutari K, Fujioka M, Hosoya M, Bramhall N, et al. (2013) Notch Inhibition Induces Cochlear Hair Cell Regeneration and Recovery of Hearing after Acoustic Trauma. Neuron 77, 58-69.